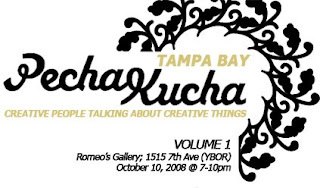 Emerging Tampa Bay Architects, with Creative Tampa Bay, is hosting Tampa’s first installment of Pecha Kucha Night on October 10th (7-10pm) during Archifest, a month long celebration of architecture and design in the Tampa Bay area. This event will give local architects, artists, designers and creative personalities a chance to present their work/ideas and enter a dialogue about design. Each presenter will have 20x20 (20 slides for 20 seconds each), totaling 6 minutes and 40 seconds per person. Slides automatically advance, leading the speaker to be concise and stay on topic. The presentations provide for a lively evening full of exciting ideas, beautiful images and good discussion about design. For each volume event night will have presentations from ten different speakers. The evening will begin with a reception; beer, wine and light appetizers, and end with a spirited conversation. INTERESTED IN PRESENTING AT PKN TAMPA VOLUME 1? A small committee of individuals (one e-tba member and Creative Tampa Bay representative) will review all entries and contact all applicants with the final selection. Submission deadline for the first installment of PKN Tampa is October 3rd.